I exhibit at two high quality, vetted fairs per year. I will not be exhibiting at any fairs in 2017. In 2018, I will be exhibiting at the London Art, Antiques & Interiors Fair at London’s ExCel Centre (previously known as Antiques For Everyone, London) from 12th-14th January 2018. 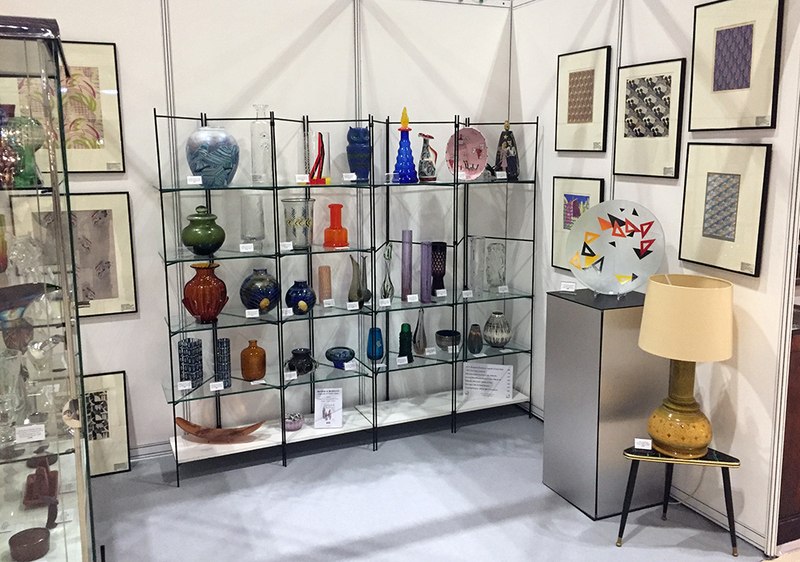 On the right is my stand at a fair in 2017, with over 150 gorgeous and desirable objects displayed for sale on shelves or in a cabinet. Please click here or on the links above for more information about the next fair at ExCel. I will be bringing an exciting and new selection of postwar Czech glass design for sale, together with a sprinkling of unusual pieces from my collection, with prices ranging from £50 upwards. I will also mount a selling exhibition of a private collection of twelve rare 18thC and 19thC framed prints relating to glassmaking and glass-selling. Highly affordable and ideal for the glass collector, prices for each framed print range from £75 to £295. I also sell my stock through a cabinet (left) in the Christique antiques centre, in Dorking, nestled in the heart of the beautiful Surrey Hills. 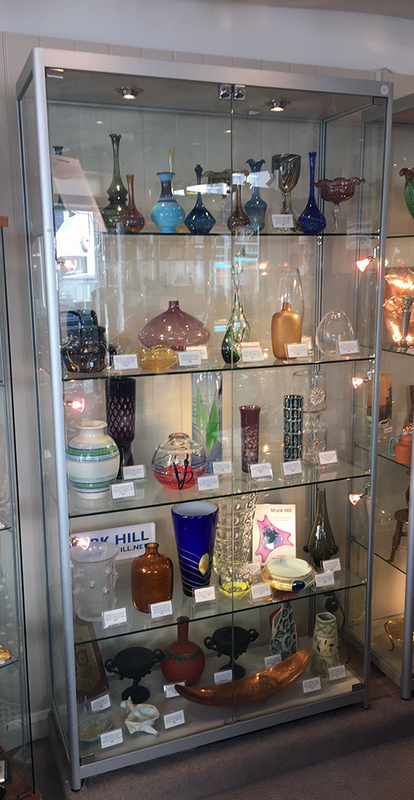 You’ll find a huge and brightly colourful selection, including 1960s-70s Lauscha glass (£15-45), Czech postwar glass design (£50-500), mid-century Italian & West German ceramics and glass, a selection of European art and studio glass (£25-220), and a collection of quirky Victorian and Edwardian pieces from my own collection (£15-150). Christique is a large, high quality, and superbly well-presented antiques centre with over thousands of objects and over 80 cabinets spread across two floors and many rooms of a large 16thC building. On the same street, you will find at least three other antiques centres and numerous shops, making a visit to Dorking – and Christique in particular – a great afternoon or day trip. Over the next few months I will be adding all my available stock to this website where you can browse and buy at your leisure, wherever you are based, 24 hours a day, 365 days a year. If you would like to view a piece in a central London location prior to buying it, this is easily arranged – please contact me on +44 (0) 7798 915474 or by emailing me via the contact form here to make an appointment. This isn’t as scary as it sounds and there’s no obligation to buy. I’ll look forward to meeting you. To receive regular updates and newsletters with information about glass and ceramics for sale, please subscribe to my newsletter using the simple form below. Amazing, rare and desirable 1950s-80s Czech, German, Italian British and American glass by great designers including Pavel Hlava, Ladislav Oliva, Karel Wünsch, Emanuel Beranek, Josef Svarc and others. A range of unusual, sometimes unique, glass with fascinating stories. An unparalleled selection of cut glass designed by Vladimir Zahour. Selected mid-century modern Italian pottery by Bitossi and others, and West German ‘Fat Lava’ pottery. A selection of antique to vintage prints, including Vauxhall Pleasure Gardens, Belgian mid-century ‘Swirl’ prints, and other artworks and mirrors. All of my own books that are currently in print.